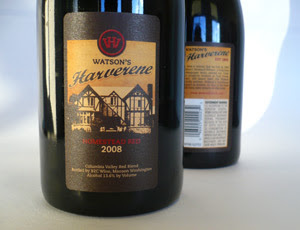 Design Hovie Studios, Inc., has designed the new wine label for Watson's Harverene Resort Homestead Red. Watson's Harverene Resort is a historic 100+ year old resort located on the shores of Lake Chelan in central Washington state. Design Hovie Studios designed the new label using a rustic, historic feel consistent with the resort and its surroundings. The main house / lodge was given center stage and embellished with crafted typography. The back label provides a brief history of the resort along with required government information. The entire project was a 3 month process designed in Seattle under the Creative Direction of Hovie Hawk.